The sun blesses us in many ways, but when it comes to our skin, it can be less than friendly. Glowing tans look beautiful and are often coveted, but they also come at a price. You may have lain out under the sun’s warming rays plenty of times in your youth, not really realizing or caring that you were damaging your skin, often in irreversible ways. As much as we love the sun, we have to remember that it doesn’t always love us back. UV damage is one of the main, if not the main, causes of premature aging and, obviously, skin cancer. It accelerates the formation of wrinkles, often forms dark spots that make us look older, roughs up texture and degrades collagen and elastin to make skin more likely to wrinkle and sag. It is also cumulative. Every time you step outside without protection, even if only for 10 or 15 minutes, that damage adds up and will show up with a vengeance as you grow older. That’s why wearing sunscreen is absolutely vital. And yet many of us neglect it. Why is that? You might be reading this thinking applying sunscreen is a pain in the neck — it’s greasy, oily and filmy, leaving behind residue and making your skin look chalky. It doesn’t smell very pleasant and it feels like a chore to apply. But that’s not quite true anymore. Sunscreen has come a long, long way in recent years. Gone are those greasy and oily formulas that made you look shinier than a crystal ball. Gone are the awful smells and white residue. Sunscreens these days are sophisticated, nourishing and moisturizing, gliding on pleasantly and absorbing readily to leave you feeling like you have nothing on. There’s really no more excuse to neglect putting on sunscreen and protecting your body’s largest, most prominent organ. Skin protects you, and it’s only right that you protect it right back. There are two types of sunscreens — those with physical ingredients and those with chemical ingredients. They both protect, albeit in different ways. Physical ingredients include zinc oxide and titanium dioxide, both mineral-based. They work by sitting atop the surface of the skin and deflecting or scattering UV rays. Some people prefer physical sunscreens because they are natural and may be less harmful in the long run (some chemical sunscreen ingredients are believed to be endocrine disruptors). Another advantage of physical sunscreens is that they protect against both UVA and UVB rays and begin working right away — there’s no need to wait 15 minutes after application to let it sink in. Physical sunscreens are generally gentler on sensitive skin, have a longer shelf life and are less likely to clog pores or cause breakouts. Physical sunscreens, however, do not last as long as chemical sunscreens when skin gets wet during activity. Chemical sunscreen ingredients include oxybenzone, octinoxate, octisalate and avobenzone. These work by absorbing UV rays and changing them into heat, then releasing that heat. Chemical sunscreens tend to be easier to apply than physical sunscreens due to a lighter consistency. They are also more likely to be water-proof and sweat-proof, but may be irritating or pore-clogging. There is some research that suggests chemical sunscreens may affect hormones, although more research is needed to fully determine whether this is true. Chemical sunscreens feel much less greasy and won’t leave a white film behind. SPF (sun protection factor) determines how well sunscreen will protect your skin from damaging UV rays. There are two types of UV rays — UVB and UVA. UVB rays are shorter than UVA rays. They are the rays that cause skin to burn and turn red. UVA rays are longer, and are primarily responsible for degrading collagen and causing premature aging. It can sometimes be very confusing to determine which amount of SPF is ideal. The truth is all of them block more than 90% of UV rays and the differences between them are rather negligible. SPF 15 blocks 93% of UV rays, SPF 30 blocks 97% of UV rays and SPF 50 blocks 98% of UV rays. Most dermatologists recommend using at least SPF 15, but if you’re using SPF 30, you’re in good shape and there’s not necessarily a need to go higher. Figuring out which sunscreen is best for you will really depend on your skin type. If you have sensitive or oily skin, you should steer toward physical sunscreens. If you have normal or dry skin, chemical sunscreens with moisturizing ingredients can be beneficial. We’ve compiled a list of some of the lightest, most effective and best sunscreens (you can also think of them as the best face moisturizers with SPF) on the market, most of which provide ample hydration to keep skin soft and provide other anti-aging benefits. It is simply imperative that you get into the habit of using sunscreen every day, rain or shine, overcast or sunny, to fully protect yourself from premature aging, dark spots and skin cancer, and keep skin healthy and youthful. And remember – tanning is so yesterday. SK-II’s super light formula won’t leave you feeling greasy or oily, encouraging you to apply this protection every day to prevent sun damage. The three sunscreen ingredients in this formulation are homosalate, titanium dioxide and butyl methoxydibenzoylmethane. Homosalate and butyl methoxydibenzoylmethane are chemical while titanium dioxide is a mineral sunscreen. This combination allows for truly broad protection. In addition to the active sunscreen ingredients, this product also contains a number of moisturizing ingredients and anti-aging ingredients to boost the protection factor while also softening skin. Opuntia extract, a type of cactus extract, provides antioxidant powers to neutralize free radical damage, and niacinamide (vitamin B3) helps with strengthening the skin barrier. This sunscreen will feel more like a moisturizer than the typical sunblock thanks to its airiness, and is a great addition to your skin care regimen. This nourishing, moisturizing sunscreen is ideal for all skin types. The active sunscreen ingredients are zinc oxide and octinoxate, a combination of mineral and chemical to protect against both UVA and UVB rays. This formulation is also oil and fragrance-free, making it safe for both oily and sensitive skin — it won’t make you break out or cause irritation. This is a thick, luxurious cream that nonetheless absorbs easily without leaving any white residue or greasy feel. EltaMD’s sunscreen was specifically created for those with skin prone to discoloration, rosacea and acne. It is a truly gentle formula that won’t clog pores, won’t irritate sensitive skin or exacerbate discoloration. Meanwhile, nine percent transparent zinc oxide as the main ingredient also won’t leave behind that dreaded white film. This formulation also contains niacinamide to help treat discoloration and lactic acid to gently exfoliate to reveal healthier skin. You really can’t go wrong with this one. This is an oil-free chemical formula that promises a dry or matte texture thanks to minerals perlite and silica. It also has the remarkable ability to absorb oil and help prevent breakouts. This sunscreen further contains antioxidants to help stave off free radicals that go hand-in-hand with UV rays. A light, easily absorbed formulation, it will make you feel like you have nothing on while vigorously protecting you from all types of damage. This is a chemical sunscreen that’s been recommended by the Skin Cancer Foundation. It is very light and feels weightless, while providing 40 minutes of water resistance and up to 24 hours of hydration. The main sun blocking ingredients are avobenzone, homosalate, octisalate and octocrylene. These are the active ingredients that protect from sun exposure. However, there are also antioxidants like vitamin E in this formula to further prevent free radical damage and reduce oxidative stress. It should be applied 15 minutes prior to sun exposure and reapplied every two hours. Kiehl’s Super Fluid Daily UV Defense Sunscreen is another super lightweight formula with a matte finish. This is a chemical sunscreen containing all of the main chemical sunscreen ingredients like avobenzone and oxybenzone. It also contains baicalin and vitamin E to provide antioxidant protection. Baicalin is a scutellaria root extract often used in Chinese medicine for its ability to scavenge free radicals. This is a physical sunscreen that nonetheless will not leave behind white residue. It is formulated with 2% titanium dioxide and 17% zinc oxide for maximum protection. A variety of ceramides (oils naturally occurring in the skin) also comprise this formula, adding to its ability to strengthen the lipid barrier. The lipid barrier is what keeps skin safe and protected from pollutants and irritants that can cause such side effects as redness, itchiness, irritation and dryness. This is an oil-free formula good for all skin types. Another chemical sunscreen that won’t leave you feeling greasy, Ultrasun’s SPF 50 sunscreen contains octocrylene and butyl methoxydibenzoylmethane as its main active ingredients for UV protection. It also contains vitamin E to provide free radical protection, panthenol (vitamin B5) to provide hydration and bisabolol to calm and soothe. It does not contain any fragrance, mineral oil or preservatives. This is essentially a moisturizer with SPF that will leave skin soft and fully hydrated. It contains a variety of botanicals, including eucalyptus, to provide hydration and sodium hyaluronate to lock in moisture and keep skin looking plump and youthful. It is specifically formulated to protect from the type of UV light that creates hyperpigmentation (dark spots) and is ideal for those prone to the condition. 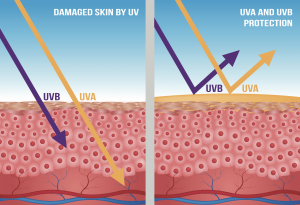 Oleosome technology helps give a major boost to the SPF to provide even greater protection. Elizabeth Arden’s Prevage City Smart physical sunscreen protects against several types of environmental aggressors in addition to UV light. It has been designed to shield skin from pollution and smoke as well. Its DNA Enzyme Complex fortifies skin to make it less susceptible to pollutants, while a potent antioxidant blend (including green tea and ferulic acid) scavenges free radicals to reduce further damage. Ferulic acid also helps brighten and reduce discoloration. This chemical sunscreen has a lovely mousse texture that is easily applied and easily absorbed. It may even make sunscreen application fun. Something that is desperately needed. In addition to avobenzone, homosalate, octinoxate and octisalate to provide UV protection, it boasts coconut oil, blue sea kale and olive fruit extract to nourish, hydrate and bring on antioxidant benefits. A golf-ball sized amount will cover each arm, two are recommended for each leg and one for the neck and chest. Awarded the Skin Cancer Foundation Seal of Recommendation, this sunscreen is light and absorbs into the skin quickly for a seamless finish. This is a physical and chemical sunscreen that contains zinc oxide and octinoxate to provide truly broad spectrum protection. It also contains antioxidants caffeine and silybin (from milk thistle). Both are powerful free radical scavengers that prevent and help treat UV damage that degrades the skin matrix. A physical sunscreen containing zinc oxide, Drunk Elephant’s formulation is also chock full of antioxidants. Grape juice extract, sunflower shoot extract and astaxanthin shield from both free radicals and other environmental stressors brought on by pollution. Despite being a physical sunscreen, this formulation will not leave any film or a chalky appearance. It is also free of fragrances and essential oils, which can be potentially irritating. This is the perfect solution for sensitive skin types. This is a sunscreen and perfecting tint in one, both protecting and giving skin a light tint to help even out skin tone. It also happens to work on all skin tones, which is a nice bonus. This is a fully physical formula that feels absolutely weightless and blends well with makeup. It also contains hydrolyzed wheat protein to help skin retain water and will be highly moisturizing in addition to giving skin a nice plumping effect.